Show report – pictures to follow! 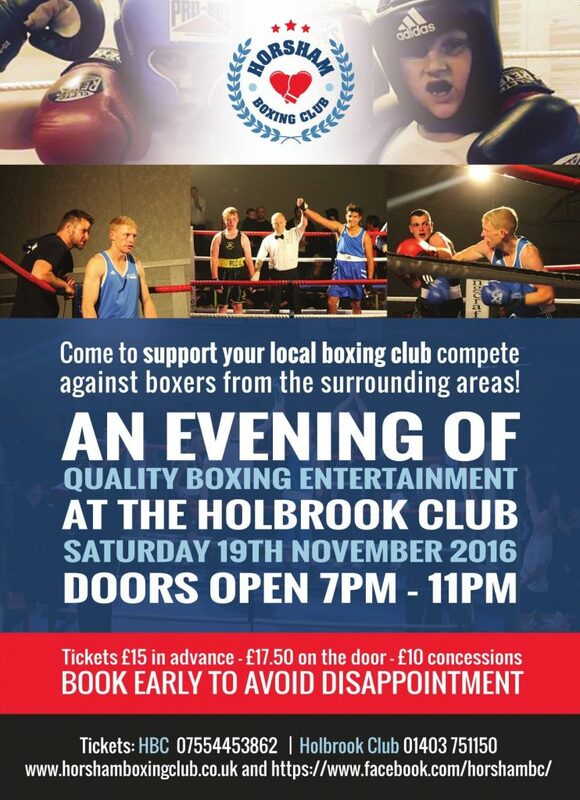 Horsham Boxing Club enjoyed another successful annual show last Saturday the 14th November. Running for the 6th year in succession at The Holbrook Club in North Heath Lane, the evening provided more excitement and top boxing entertainment to a packed crowd of around 400. The event provided 14 bouts kicking off with Max, son of trainer Lee Cole whos birthday corresponded with the date, prompting the MC to lead a rousing sing along of Happy Birthday to You! Max, at only 10 years old is only able to compete in ‘skills’ bouts which allow the competitors to sample the experience of stepping in to the ring but with out the pressure of a winner being declared. This was Max’s 5th skills bout and it was a rematch against game young Brandon Paul from the Waterside Club in Hampshire. Both boxers matched skill with desire and got the show off to a great start. After a cross matched skills bout featuring two young lads from the Crawley and Stonebridge clubs, the show moved onto junior bouts commencing with 13 year old Horshams Tom Creasey who took on Olly Blythe from Titchfield in Hampshire. Creasey was competing in his second bout and looked to force things from the off, using slick movement and skill on his way to a points win and impressing the crowd. Harvey Divall followed, up against Yousif Shah from Bognor. Divall gave his all and battled hard throughout the three rounds but couldn’t complain with a points loss to the slightly taller Shah. In the fifth bout of the night, Horshams 77kg 15 year old Aaron Tarrat faced Vincent McCafferty from Stonebridge. Looking the taller and physically in better shape of the two, Tarrat started strong and fast, dominated from the off and stopped McCafferty with the first round. His second win in 3 bouts. Next up for Horsham was the final junior bout of the evening and another heavy young lad in Marley Bygrove, boxing at light heavyweight at just 16 years old, he faced Luke Windsor of Crawley and again, looked in better shape coming into the ring. Bygrove also started fast but Windsor did throw back and didn’t let Bygrove have things his own way during the first minute as the obviously stronger Horsham boxer looked to press his height advantage. A stunning right hand towards the end of the round, put Windsor on his knees and he failed to beat the referees count, given Horsham a second first round stoppage win in a row. After an interval that saw Horshams female talented Sam McCelland presented with her medal for recently reaching the national development championships finals, the show continued with the senior bouts. Ryan Jones was first up, boxing against Jack Bowers from Bexley – both weighing in at 64 kilos. This was Joness first bout although this wasn’t obvious from his skill levels as he boxed fantastically behind a great jab and a powerful right hand against a game and skillful opponent. Jones took a wide unanimous points win and was Horsham trainers boxer of the night with a stunning debut. He boxes again this weekend in Sevenoaks. Leon Lawlor was next up to represent his club against Hasan Akhtar from Bognor. Lawlor started well, taking the first round by making his height tell. In the second round Akhtar came back with some good pressure, forcing Lawlor onto the back foot. A close final round saw the Bognor fighter take the bout on points. Club captain Simon Bayliss was up next against Andrew Farley from Bexley. Both men weighing just 53kg – this was a battle from the off with Bayliss chasing his opponent down but finding it hard to get to him with telling shots. The Bognor boxer ended up winning the bout on points in another well matched contest. Jeter Berte competed next in his first bout for Horsham. Jet started really well, taking the fight to his taller opponent, Sam Northcott from Crawley. In the second round, the Horsham boxer caught Northcott with a great shot and sent him to the canvass for a count. The Crawley boxer recovered well though and started to come back as Berte tired visibly. In the final round, Horshams Berte continued to show signs of fatigue and was also docked a point harshly by the referee for holding. This ended up tipping the decision to Northcott in a very close bout. Closing the show for Horsham was Ben Gumbrell. Returning to the ring after 6 year absence, Gumbrell, a 30 fight experienced fighter took on Paul Simmons from Earlsfield in London. Gumbrell had a lot of support from the home fans who cheered him into the ring as the time reached 11.30pm. Gumbrell worked hard against another experienced boxer as he looked to close the show in style. Rolling back the years in the final round with some crisp one twos and overhand rights weren;t quite enough for Ben to take the decision which went on points to Simmons.